It’s official. Tesla Motors have launched in Ireland. The all-electric car maker opened its new showroom in Sandyford Dublin recently. Until now, Irish customers have had to travel to the UK or mainland Europe to place their orders. Founded in 2003, the company’s stated mission is ‘to accelerate the advent of sustainable transport by bringing compelling mass market electric cars to market as soon as possible.’ That goal appears to be some way off yet as Tesla Motors currently offer premium electric powered vehicles. To coincide with the official opening in Ireland, Tesla brought their UK press fleet over for Irish motoring journalists to test drive. The event route was designed to show off the range of the lithium ion batteries and to give ample time to experience the tech-filled interior. The test drive featured both of Tesla’s current offerings. Model S is a premium electric saloon that can accelerate from 0-60mph in 2.8 seconds. While Model X is an electric SUV that can go from 0-60mph in 3.2 seconds and has double-hinged falcon wing doors that can open in spaces with a minimum of 30cm clearance. Both Model S and Model X have a NEDC range of over 500 kilometres. Software is updated using over air downloads. Unfortunately, the ‘autopilot’ mode was offline so the autonomous driving mode couldn’t be experienced on the day. The Tesla design uses a lithium ion battery that’s located on the floor of the car. As an electric all-wheel drive, there’s no drive shaft tunnel so the floor of the car is completely flat. The result is more interior space. 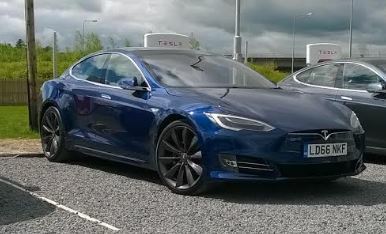 The test drive followed a route along the M50 and M8 motorways to the Tesla’s own charging station located off the Junction 3 exit at Ballacoola. Known as a Supercharger, these stations are intended to facilitate longer distance drives. The driver app allows the driver to monitor the charging process. Tesla says that an overnight eight hour charge should be sufficient for everyday travel and commuting. In Ireland, the car batteries can also be re-charged at any of the free standing point charging locations across the country. The next stage of the test drive took us along national and local roads to a destination charger located at Brook Lodge in Co. Wicklow. Tesla has placed 10 of these charging points at hotels and resorts across Ireland. The 17 inch central touchscreen is the command centre for the car’s tech. The display features sat-nav information and the feed from the reverse camera. The front passenger can also go online. And yet, this central feature could affect driver concentration. Most features are voice activated to minimise this risk. However, the touchscreen is in the driver’s line of sight. For some drivers, this could result in information overload. The car also comes equipped with radio and Spotify accounts-though this stops playing in areas with poor broadband coverage. The test drive vehicles featured impressive sound systems that can be added as an optional extra. The touchscreen also controls the cabin climate. Model X features a HEPA air filter which has a bioweapon defence mode. What to say about the drive? Both Model S and Model X were responsive drives with smooth handling. A slight increase in pressure on the accelerator was enough to increase the speed of the car. Both excelled on the motorway at the higher speed allowed on the network. Model X’s firmer suspension coped better on the narrower country roads. One of the more surreal aspects of the electric car is the quiet. Unfortunately, the absence of the noise from an internal combustion engine means that others, especially pedestrians, won’t hear the vehicle’s approach. Drivers of electric vehicles will need to pay particular attention to the road. The digital instrument panel displays information from exterior sensors alongside road speed limits. Since this was the UK fleet, the speed was displayed in miles per hour. It also includes a miniaturised version of the sat-nav route. The car features plenty of front and back storage space. There’s no spare tyre with the car. Instead, Tesla offers roadside assistance. The amount of interior empty space gives the car this strangely sparse appearance. From a tech perspective, Model S and Model X are fitted with plenty of innovative features. However, some of these could interfere with driver concentration. And at the end of the day, the responsibility still lies with the driver. Model S All-Wheel drive is available from €92,550. Model X starts from €105,500. More information is available here.